​Kieta is located on the eastern coast of Bougainville Island, near the township of Arawa. The German New Guinea Company established control over Bougainville and Buka, Choiseul, Shortland and Treasury Islands in 1885. In 1900, Germany transferred all of its claims in the Solomon Islands other than Bougainville and Buka to Great Britain while Britain, in return, withdrew from Western Samoa. During the First World War Australia occupied Bougainville together with the rest of German New Guinea; the League of Nations placed the territory under Australian mandate in 1920. Kieta Cemetery contains one First World War burial. 118 Private Joseph Read, Australian Naval and Military Expeditionary Force, A. I. F. died 11th February 1915. 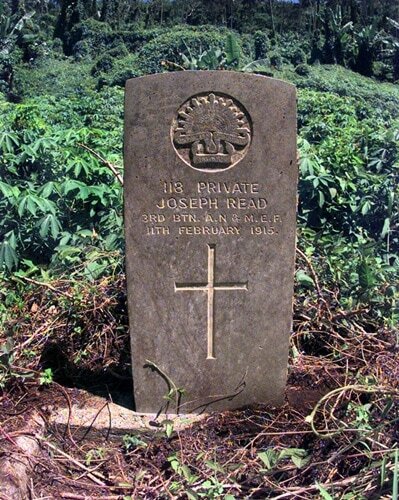 (Please note the CWGC have 188 as Joseph's Regimental number in their database). Picture of Grave courtesy of Ken Wright.